Different regions and countries of the world face a serious need to design and make use of necessary policies and resources to better manage worker migration, thus ensuring the welfare and human rights of these people who, in the end, are of benefit to their society of origin, as well as the receiving society. Although international labor migration may turn out to be productive for many people, many of these migrant workers have unsatisfactory living and working conditions. While it is likely that their labor conditions are better than in their own country, in many cases they are inferior to the working conditions of nationals in their receiving country. Despite international standards to protect migrant workers, their labor rights are frequently abused, especially if they have immigrated in an irregular fashion. In this context, INEDIM took on the task of developing an integral and comprehensive document regarding different migrant worker and visa systems in Central and North America.The work presented here holds enormous value for delving in-depth to the forms of management of temporary migrant workers, as well as their access and guarantees to social and labor protection in North and Central America. This report addresses the problem of management of labor migrant flows among countries in our region. This study is based on an ordered and scrupulous methodology in which different migration systems and visa schemes for the hiring of temporary migrant workers are analyzed from the perspective of protection, respect for, guarantees and promotion of human rights. The study analyzes six systems that seek to regulate temporary migration in the region along the Central and North American corridor. The countries involved in these six systems are El Salvador, Guatemala, Mexico, Canada, the United States, Costa Rica and Nicaragua. 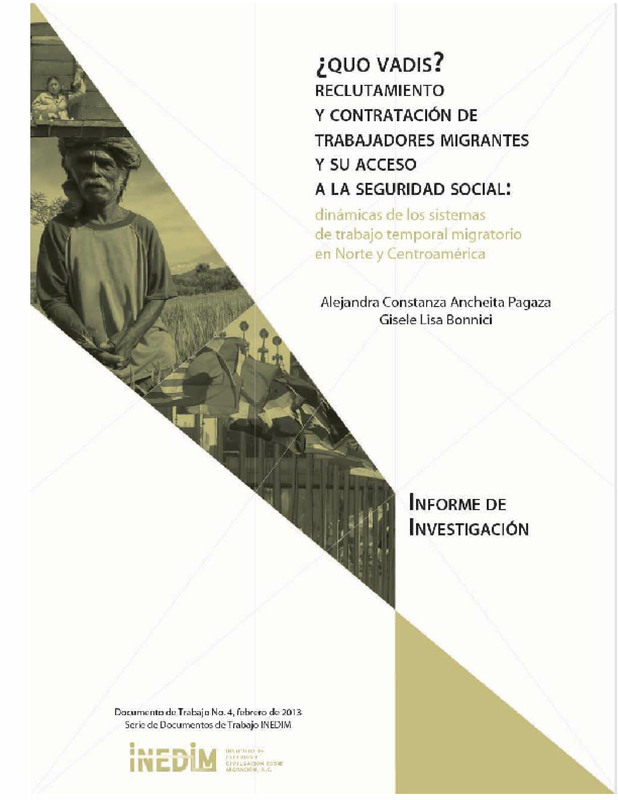 The authors carry out a thorough and well-structured study based on two focuses of analysis: first, the processes for recruiting and contracting migrant workers and secondly, access to social protection for temporary migrant workers by means of the right to social security. From these two focuses, the authors are able to identify and demonstrate structural insufficiencies and gaps in the analyzed systems, which should guarantee labor security and social security for these workers. Copyright 2013 Instituto de Estudios Y Divulgacion Sobre Migracion, A.C. (INEDIM).